Twitter advertising has posted fourteen dronies since the Cannes advertising festival began on Sunday, and the account is nearing 3,000 followers. Twitter made a grand entrance at the Cannes Lions International Festival of Creativity for the marketing and communications industry on Sunday. 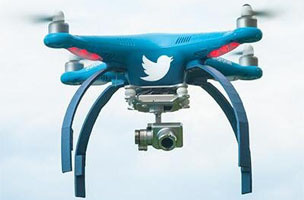 The network is using drones to make Vine videos of attendees with Twitter employees and uploading them to a new Twitter account with the handle @dronie. Patrick Stewart — who co-stars in a Twitter documentary to be shown to the festival’s ad industry execs — appeared the first post. Fourteen dronies have been posted since Sunday and the Twitter advertising account is nearing 3,000 followers.